From 1984-1994, I did a number of really bad fancomics based on Doctor Who. 123 total, before I felt burnt out and stopped. Now that I think about how I'm currently stuck at 124 Ghostbusters fan fics, it makes me wonder if ~120 is my wall or something. Colin Baker, the Sixth Doctor, had just become the incumbent around that time, but all I'd ever seen on TV was Tom Baker. Still, I was itching to do something, and my Eighth Grade self came up with the "brilliant" idea of inventing my own Doctor! Since I was in Eighth Grade, he'd be the Eighth Doctor! So I made my own Doctor, who turned out to be nothing like the real Eighth Doctor, Paul McGann. I did keep tweaking and evolving the character design over the years; my fan fic character Zandrik Fallagar ( www.ectozone.com/images/spoile… ) is the "final" form of the design I came up with in 1984. The next year I regenerated him into a Ninth Doctor who was, again, nowhere near Christopher Eccleston, a blond guy who didn't even wear a coat. I got tired of that one fast and created my own Tenth Doctor, based off a friend of mine in Junior High; I will say that he sortof presaged the real Tenth Doctor, David Tennant, by becoming one of the favorites of the series. An evolution of his character design was the basis of Dr. Enrico Amore, a character that appeared in "Ghostbusters 2021: the Eye of Aretpo" (see picture at same link as Fallagar). I came up with the character design in 1985; I admit I was kind of thrilled when, a couple years later, a real Doctor (Sylvester McCoy) had a vaguely similar short scarf and jacket as his look. I finally relented and regenerated the Doctor again after a big battle with the Black Guardian in the 75th issue. My apocryphal Eleventh Doctor was based off Rick Hunter/Hikaru Ichijo dressed like a college professor, so I consider this the closest to "right" I ever got--a guy with long black anime hair and a tweed jacket does get almost into the ballpark of Matt Smith, the real Eleventh Doctor. I went along sporadically after that, actually sorta "cancelling" the book after #87, but in 1990 I got the bug again and started doing them again...I know this will shock and possibly horrify readers of modern comic books, but I restarted the series with #88, where I'd left off, instead of doing a new #1. I would do one story with my fake Eleventh Doctor and at the end, he would regenerate into my own Twelfth Doctor. 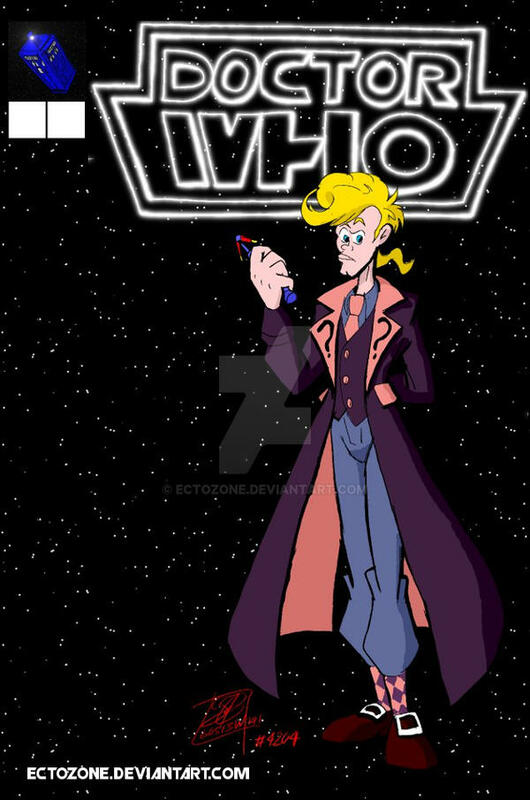 So...I guess, considering there was a Saturday Morning Cartoon that was still in first run in 1990 which is all over pretty much everything I've ever done in the internet, it's probably not a surprise that the Twelfth Doctor I created twenty three years ago looks like Egon Spengler. The outfit was influenced by Egon's flight suit colors, obviously, with bits and pieces of Tom Baker's 1980 outfit and other John Nathan Turner era Doctors...which also explains the giant question mark lapels, I would think. Anyway, since today's the Doctor's fiftieth anniversary, and the real Twelfth Doctor (depending on how you count it), Peter Capaldi, set to debut soon, I thought it would be amusing to put this out there today. What's your opinion on My Little Pony's nod to the show, in the form of a background pony known as Doctor Whooves? Heard of it, and seen the toy, but haven't watched MLP. Can't really say any more than that.